A Seed Digimon whose body surface is covered in transparent tissue. Its real body can be confirmed to be within the transparent skin, and seems to be a variant of Botamon. 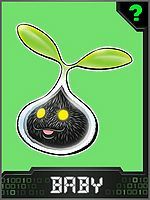 It is thought that it is perhaps a species of Botamon whose appearance transformed into this herbaceous body. For that reason, it is not only a Plant-species Digimon, but it also has the potential to evolve to Dragon-species Digimon and the like. Its personality is extremely gentle, so it has a timid face. Its offensive ability is nonexistent, so it flings the popping seeds of its "Seed Cracker", then while the opponent is surprised, it quickly flees. 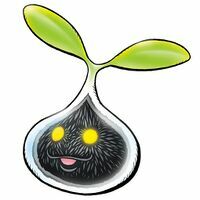 Nyokinyoki 「ニョキニョキ」 means "plants sprouting one after another". Seed Cracker  シードクラッカー Shīdo Kurakkā Tries to spit out seeds in order to surprise the enemy long enough for to escape. Nyokimon is the partner of Takenouchi Sora. Nyokimon appears in Digimon Adventure as Piyomon's Fresh form during a flashback of when the Digitamas first hatched on File Island. This Digimon was seen with an Elecmon and some other baby Digimon as Black War Greymon passes through their forest. Some Nyokimon also became partners to the Dark Seed children (including Hiroshi) during the battle against Belial Vamdemon. A bunch of Nyokimon are protected by Jyureimon. They helped Jyureimon tend to the injured Digimon when Kurata Akihiro and his group returned to the Digital World. Nyokimon is available as a Digimon Medal.